Marine environments are currently under immense pressure. Their problems primarily arise through anthropogenic causes, such as overfishing and environmental destruction. However, research suggests that fisheries are able to recover or stabilize their populations when responsible management and regulations are in place. Unfortunately, most seafood that is obtained is done so through “irresponsible fishing practices that continue to modify some marine ecosystem.” This has resulted in record depleted stocks. For example, “85 percent of the world’s fisheries are fished at or beyond their maximum sustainable limit.” Considering the rising global population and the pressure that it has, and will continue to exert on the Earth's resources, a more sustainable method of fishing is necessary if humans wish to utilize its natural abundance. The Sustainable Seafood Movement is an initiative born through the realization that the marine ecosystems of the world were being overexploited and destroyed. It began in the 1990s and was driven by social marketing through Ecolabel and awareness campaigns. Through social marketing, the collaboration between environmental Non-governmental organizations (NGOs) and industry allowed for the consumer to make informed choices, potentially contributing to the conservation of marine biodiversity. Ecolabeling programs evaluate the production process with set environmental standards by an independent third party. Should the process fulfill the specific requirements, the producer or marketer may purchase a license to use an ecolabel in its marketing. This label allows the consumer to know that the product was produced sustainably. Labeling is not only an effective regulatory tool in encouraging consumers to make environmentally friendly choices, but it also provides a financial benefit to producers. In 1996 the Marine Stewardship Council (MSC) implemented the first certification program Since then, they have not only made a distinct effort to maintain the health of ecosystems, but they have also contributed to more financial success for producers. For instance, once the American Albacore Fishing Association had its tuna certified to the MSC standard, they were able to obtain premium prices for their product. For the small fishing community in Bonita, California, certification allowed them to sell direct, as opposed to depending on the instability on the dock. They were able to make a profit of $2,260 rather than $1,700 per tonne. More companies and organizations are choosing to use environmentally sustainable production, such as ecolabeling, to gain a greater market share and higher profits. Awareness campaigns focus on educating the public and encouraging them to purchase products that consider the vitality of marine species. They do so through boycotts of certain species and products as well as through seafood guides. Seafood guides highlight which species are acceptable to consume and which are not based on their environmental impact. Guides are typically constructed into three categories, some using the analogy of a traffic light's colours: red, yellow, and green. These rankings are based on how the fish responds to fishing pressure, abundance, gear impact, Bycatch, and management. Red represents items to avoid, yellow is a good alternative, and green is the best choice. Several organizations, including the Monterey Bay Aquarium, have developed their own guides or wallet cards to be distributed to the public. The Seafood Guide below, made by SeaChoice, highlights which species are best to eat, and which should be avoided based on their management, abundance, and whether they have been caught or farmed in environmentally sustainable ways. It allows consumers to be informed of their choices and vote with their wallets. There are a wide variety of fishing methods used. Each has its own environment impact that varies on intensity. The table below highlights a fishing method along with its environmental repercussions. Gillnetting Uses a system of nets with floats and weights. 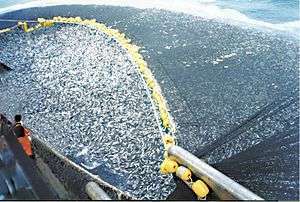 The nets are anchored to the sea floor and allowed to float at the surface Sardines, salmon, cod Animals cannot see the net therefore, they swim into it and are tangled. Huge risk of bycatch. Longline fishing Fishing line cast out from the boat. Can range from one mile to 50 miles. 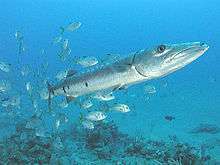 Pelagic fish Higher risk of bycatch. Fisherman use weights to sink their lines, which reduce the risk of bycatch. Traps and pots Wire or wooden cages attached to the sea floor; fishing weirs Lobsters, crab, shrimp The traps keep the fish alive. Lower chance of bycatch. Harpooning Harpoon Large pelagic fish Fisherman have to visualize prey. No chance of bycatch. Trawls and dredges Use huge nets that can either drag on the bottom of the sea floor or in the middle of the surface or the floor. Pollock, cod, flounder, shrimp Large number of bycatch. Can damage the sea floor. The National Oceanic and Atmospheric Administration (NOAA) is a national government agency that has authority over conservation, marine fisheries, and management. The NOAA has created FishWatch to help guide concerned consumers to sustainable seafood choices. The fisheries in the United States are overseen by the Ten National Standards of the Magnuson–Stevens Fishery Conservation and Management Act. Therefore, the National Standards are protecting the fish population and eliminating overfishing. Along with the Magnuson-Stevens Act, U.S. fisheries are also regulated under the Endangered Species Act and Marine Mammal Act. The NOAA fisheries service has started using aquaculture to produce sustainable seafood. Aquaculture is fish or shellfish farming. The aquaculture fisheries hatch and raise the fish until market size. By using aquaculture the wild fish will be able to repopulate without the threat of overfishing. The aquaculture fish have a variety of uses including: food, nutritional, and pharmaceutical. Two types of aquaculture exist. Marine aquaculture farms the fish species that live in the ocean and fresh water aquaculture is the fish species that live in freshwater. NOAA is focusing on an alternative seafood source to help with repopulate and save the ocean's ecosystems. The Marine Stewardship Council is a global non-profit organization looking to conserve the oceans. Their mission is to use a combination of certified fisheries and ecolabeling to make the people aware of how important it is to preserve our oceans. The MSC works with fisheries, scientist, seafood companies, conservation groups and the public to encourage environmental friendly seafood choices. The two main ways the MSC regulates sustainable seafood is by setting standards for certified fisheries and ecolabeling. The fishery may not overexploit any of its resources. Each fishery is judged on the amount of environmental impact they contribute to the ocean. The fishery may not use any form of fishing that destroys the structure, productivity, function, or diversity of the ecosystem. Not only does the fishery have to follow the two other MSC standards, but they also have to follow all local, national, and international laws. Once a fishery has been reviewed and certified, their certification lasts for 5 years. In that 5 years, the fishery will be inspected and held to the environmental standards of the MSC. After the 5 years has passed, the fishery will have to go through the approval process again. The second way the MSC regulates seafood to the public is by using their ecolabel. The ecolabel on seafood products guarantees the seafood has come from a sustainable source and certified fishery. The ecolabel can be found around the world. The consumer can feel good about buying seafood with a MSC ecolabel. Before a seafood product can carry the MSC eco-label, the fishery must acquire the MSC Fisheries Certification. Additionally, all companies in the supply chain that take ownership of the product including distributors, wholesalers, manufacturers, pack houses, traders, retailers, catering organizations and restaurants must acquire the MSC Chain of Custody Certification. Critics condemn the Marine Stewardship Council for certifying specific fisheries that may be in trouble, harmful to the environment, or where there is a lack of information available. For example, the Antarctic toothfish fishery in the Ross Sea was awarded an MSC label, despite a lack of basic information on the stock itself. A Marine Policy study that analyzed the stocks of MSC fisheries found that 31% of the stocks were overfished, and 11% did not have suitable information available. Currently 30 fisheries around the world are certified under the Friends of the Sea. 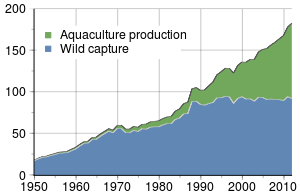 In 2004, aquaculture accounted for 32% of the total production of fish. Aquaculture is becoming more popular with an 8% rise per year in the last 30 years. Currently there are 75 aquaculture certified by Friends of the Sea. Due to growing public concern about overfishing, many seafood restaurants have begun to offer more sustainable seafood options, with some restaurants specializing in sustainable seafood, exemplified by Miya's, a restaurant headed by chef Bun Lai, a 2016 White House Champions of Change for Sustainable Seafood recipient. Miya'sis on the vanguard of the sustainable seafood movement as the first sushi restaurant to specialize in sustainable seafood. Today, there are sustainable sushi restaurants throughout the U.S., Canada, and England, and many more sustainable seafood restaurants in general.Due to eco-labeling, seafood guides, traceability schemes, sourcing policies, and awareness initiatives there are more chefs and restaurants involved in the sustainable seafood movement than ever before. 1 2 3 4 Bassan, Janine (May–June 2011). "Not all seafood is equal". South African Journal of Science. 107 (5/6): 8–10. doi:10.4102/sajs.v107i5/6.718. 1 2 3 4 5 Cooke, Steven J; Murchie, Karen J.; Danylchuk, Andy J. (November 2011). "Sustainable "Seafood" Ecolabeling and Awareness Initaitives in the Context of Inland fisheries: Increasing Food Security and Protecting Ecosystems". BioScience. 61 (11): 911–918. doi:10.1525/bio.2011.61.11.10. 1 2 3 4 5 6 Roheim, Cathy, A (2009). "An Evaluation of Sustainable Seafood Guides: Implications for Environmental Groups and the Seafood Industry". Marine Resource Economics. 24: 301–310. ↑ Czarnezki, Jason J. (1 February 2011). "The Future of Food Eco-Labeling: Organic, Carbon Footprint, and Environmental Life-Cyscle Analysis". Stanford Environmental Law Journal. 3. 30 (1): 3–49. ↑ SeaChoice. "Make Smart Seafood Decisions for Today and Tomorrow" (PDF). SeaChoice. Retrieved 20 November 2012. 1 2 3 4 "NOAA:Aquaculture"
1 2 3 4 5 "
↑ Williams, Daniel Zwerdling Margot. "Is Sustainable-Labeled Seafood Really Sustainable?". NPR.org. Retrieved 2015-06-08. 1 2 Smith, Lewis. "Sustainable fish customers 'duped' by Marine Stewardship Council". the Guardian. Retrieved 2015-06-08. ↑ "Evaluation and legal assessment of certified seafood". Marine Policy. 36: 1284–1289. doi:10.1016/j.marpol.2012.03.017. Retrieved 2015-06-08. ↑ "Friends of the Sea"
↑ "Friends of the Sea Fisheries"
↑ "Friends of the Sea Aquaculture"
Jacquet, J.; Pauly, D. (2008). "Trade secrets: renaming and mislabeling of seafood" (PDF). Marine Policy. 32: 309–318. doi:10.1016/j.marpol.2007.06.007. Jacquet, J.; Pauly, D. (2007). "The rise of consumer awareness campaigns in an era of collapsing fisheries" (PDF). Marine Policy. 31: 308–313. doi:10.1016/j.marpol.2006.09.003. "Sustainable Seafood Factsheet". Waitt Institute. Retrieved 2015-06-08.